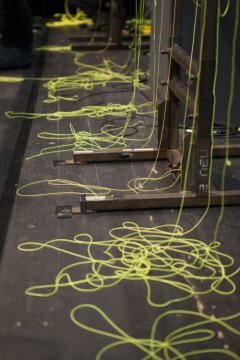 In her production “Pulling Strings” Eva Meyer-Keller literally takes the threads into her own hands. 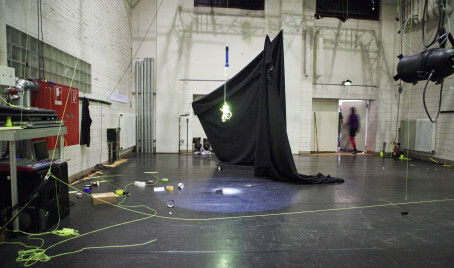 On the stage are objects that have been assembled from backstage, artists cloakroom, technical warehouse and kitchen: a ladder, a broom, an extension-cable, a plant, a scissor, a thermos jug, tape and so on. 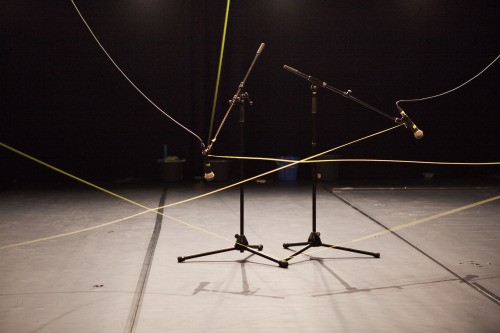 Attached to the objects are threads which are being pulled by the two performers. Thus they set this mix of objects into motion. A fire extinguisher pirouettes, a microphone stand falls down. What on first sight seems to be very simple turns out to be more and more complex, inspiring the imagination of the beholder. 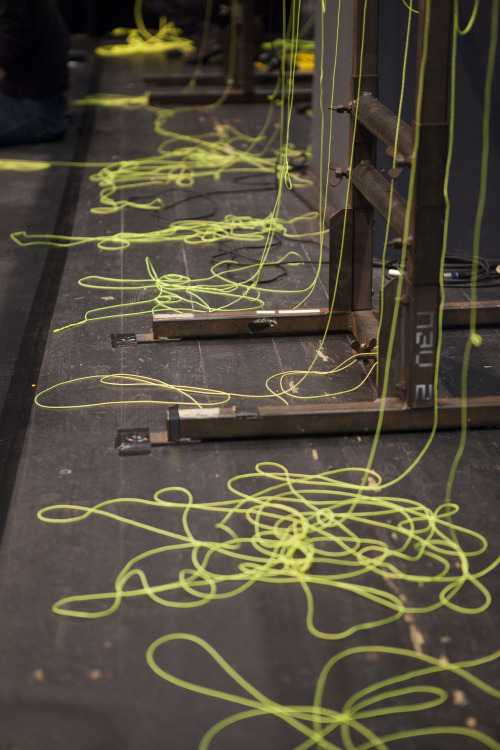 Similar to earlier works like “Death is Certain”, “Good Hands” or “Building after catastrophes”, “Pulling Strings” is also located at the intersection of performance, art and object theatre. The focus this time is on the choreographic aspect. The objects start to dance. 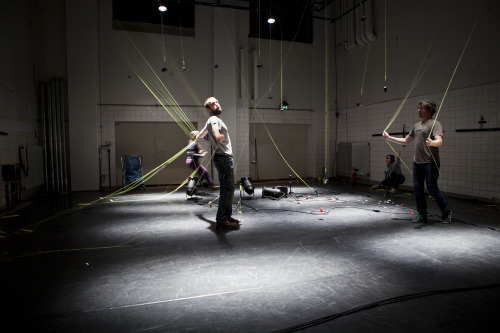 Eva Meyer-Keller (DE/SE), works mainly on performance and has been showing her work throughout Europé and America, in galleries and in theatres. Educated at SNDO (School for New Dance Development) in Amsterdam. Before, she studies photography and visual art in Berlin and London. She makes performances, organises festivals and develops projects with other people and makes video works. She has also worked with for example Baktruppen, Jerome Bel and Christine de Smedt. Concept: Eva Meyer-Keller. In collaboration with: Tomas Fredriksson, Sheena McGrandles, Irina Müller, Sybille Müller & Benjamin Schälike. Development pulling systems: Florian Bach, Ruth Waldeyer. Mangement: Susanne Beyer. Thanks to: Andrea Keiz, Thomas Medowcroft, Rico Repotente. Production: Eva Meyer-Keller (Berlin) Co-production: Kunstenfestivaldesarts, Hebbel am Ufer/HAU (Berlin), MDT (Stockholm) Supported by: Hauptstadtkulturfonds, International Dance Programme/Swedish Arts Grants Committee. Thanks to: PACT Zollverein (Essen). The performances in Brussels and Stockholm are supported by the Berlin Senate Cultural Affairs Department. The performances in Stockholm are supported by Goethe Institut and the Swedish Arts Grants Committee.